For use on: Prescription glasses, safety glasses, sunglasses, goggles, masks and face shields. Easy application: Spray, Wipe n' Go! 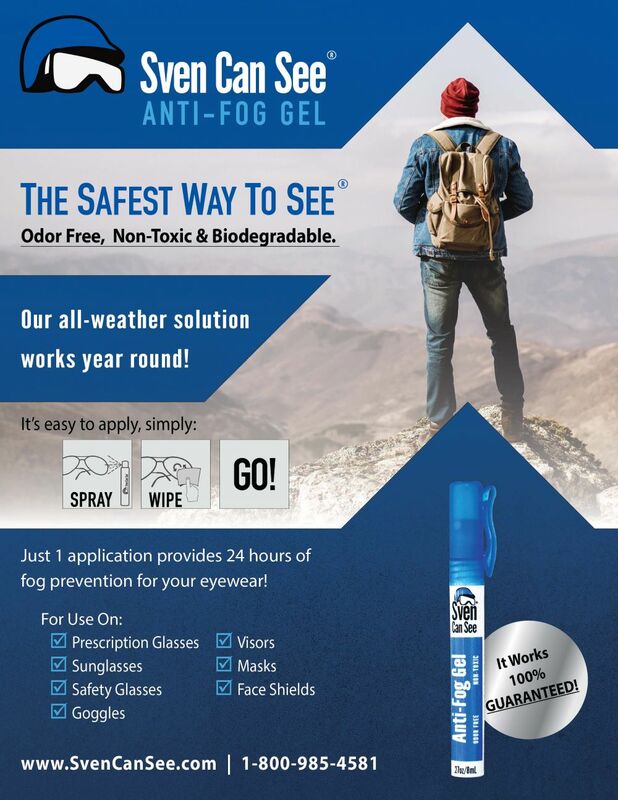 One order of Sven Can See Anti-Fog Gel includes (one) 0.27oz / 8mL pen-like spray applicator, (one) microfiber lens cleaning cloth and comes with a 100% money back guarantee. Operating in extremely cold temperatures? Try our Sven Can See® Anti-Fog/Anti-Frost Xtreme Cold Spray Gel instead! It prevents fog AND frost from developing on your eyewear in temps as low as -20°F! *We recommend using our Sven Can See® Lens Cleaner in conjunction with Anti-Fog Spray Gel, however it is not required in order to have great success with this product. *Scuba Divers: If you rinse out your mask after each dive, we recommend thoroughly drying your mask and reapplying the product before your next dive. *Thoroughly clean and dry your lenses before applying. We recommend using our Sven Can See® Lens Cleaner, however it is not required in order to have great success with this product. Lightly spray Anti-Fog Gel onto lens surface (just one drop will do!). Using your finger, spread solution evenly onto both sides of both lenses. Enjoy fog free vision with The Safest Way to See®! *Seems too easy? It really is! Check the Videos tab for a demonstration. This past summer I hiked to get to my favorite fishing spot. Once I arrived and stopped moving, my sunglasses fogged immediately. I bought this on-line and did the same hike a few weeks later and was fog free all day - including the hike back to my car. Works exactly as advertised. Thanks. I tried every product. Nothing worked. When I play tennis and sweat, my sunglasses fog up. Sven Can See works fantastic!